We had the pleasure of having Ellen Cheever join us for one of our Monogram Training Sessions at our Chicago Monogram Design Center this past July. She has spent the past 44 years significantly outlining the kitchen and bathroom design world, not only for consumers, but also for the industry. From just having come off her trip at EuroCucina in Milan, she went through the upcoming trends pertaining specifically to kitchen and bath. 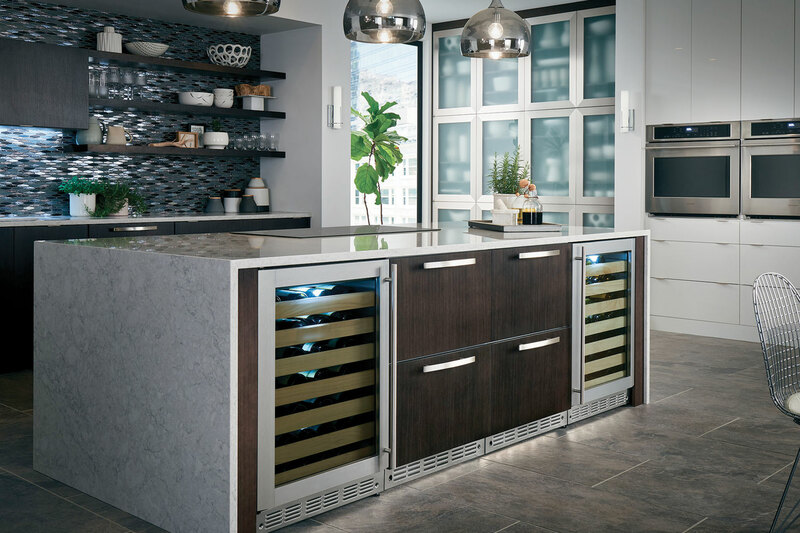 While going through all of the sleek, contemporary images of kitchen design concepts she noted, “This is the first time I’ve seen Europe and America sharing similar trends across the design.” She continued explaining how this is an exciting time of collaboration throughout metals, technology and also appliances. While speaking with her, you get this immediate sense of knowledge of all she’s learned throughout her career, but in a way that is approachable, which is why we wanted to interview her! Ellen: While I was in grade school, my mother gave me a hundred dollars if I could complete the task of remodeling our bedroom. Ever since that initial challenge, I was addicted and wanted to learn as much as I could about design. In the 70’s we didn’t have “Design Majors”, so the next best option was Home Economics which did focus more on home planning, but in college that was the closest thing. Ellen: We were working on a show house in Wilmington where they wanted our firm to do a Master Bath. It’s always challenging to make a functioning bathroom while still maintaining that showroom impression. We wanted to have that “wow” factor but with functionality, which I think we accomplished. SRFD: What is a trend you’re over? SRFD: What is a trend you’re excited about? Ellen: Contemporary wood veneers that are produced in manmade materials and also, innovations within appliance technologies. I think focusing on making equipment smarter and more intuitive but still friendly to Cooks that are a little uncertain about operating technology. SRFD: What did you learn at the Chicago Monogram Design Center? Ellen: It allowed me to expand my knowledge on the possibilities with induction cooking. I now appreciate more “combination appliances” like the Advantium. By seeing Chef Jon cook in it teamed with your presentations given on the versatility behind the product, it really made me understand its use, especially for smaller spaces. SRFD: What is your favorite Monogram product? Ellen: I loved the 30” integrated refrigerator with the combination drawer. The flexibility is fantastic, as well as, the look. This will be my last “Save Room” blog entry. After 36 years in the Design profession, it’s time to down-shift and pursue my hobbies and interests on a full-time basis. Like most designers, this will involve trying to create something of beauty, only on my time this time. I’m delighted that my successor, Marc Hottenroth, a 24 year veteran of the GE Appliances Design team, will assume the role of Design Director by the time you read this. Before signing off, I’d humbly like to share some observations on the state-of-our-art, along with some predictions. While connected appliances are in full bloom in the kitchen and laundry room, connectivity itself is still in its infancy. Yes, we’re providing new levels of convenience and performance through our WiFi enabled products, but the next meaningful wave has yet to hit the shore. That will come when we fully integrate kitchen design, rich information services, and connected appliances. What’s the “killer app”, to use an old phrase? I believe it will come in the form of quick and convenient healthy meal planning and preparation. Let’s face it, reducing the cost of health care in the US begins with our diet, and as key influencers in the kitchen, it’s time we all step-up and play a role here. We will also begin talking to our appliances. And unlike adolescent children, they will dutifully listen and respond. The cost of voice recognition technology is coming down and accuracy is improving, helping to ease access to those amazing technologies and features we’ve been incorporating into our products. Why press a bunch of buttons or dive into a multi-layered menu system when you can simply say “heat the upper oven to 350 degrees” or tell the water heater you’ll need more hot water for the guests coming to visit this weekend. For those nay-sayers convinced we’ll never talk to machines, it wasn’t too long ago that people said we’d never read our favorite authors on a piece of glass because it wasn’t as cozy or inviting as the printed page. Just as the kitchen became the focal point of our home, so too will it look less like a kitchen. Certain appliances will begin to “disappear” – first through finishes and user interfaces that blend into the surrounding cabinetry, followed by appliances that become the cabinetry. Small form-factor housing and alternative living patterns – think multi-generational households – will also contribute to us rethinking the industrial design of our products, transitioning from a machine-art to a furniture aesthetic. The mobile home, built by a robot? Today’s mobile workforce, coupled with our desire to sample a variety of living environments means we’ll delay owning a home and being tethered to a mortgage. That’s not to say we won’t seek out well thought-out, intellectually stimulating and comfortable communities, we’ll just rent a home in that community, then simply move on to the next experience whenever we’re ready for a change. Home construction building methods and techniques will dramatically change. The skilled-trade workforce that home builders have historically relied upon has dramatically shrunk since the great recession and they are not likely to return to the levels necessary to support traditional stick-built style home construction. Modular and automated factory-based manufacturing processes will finally take root after many false starts, followed by the emergence of large, on-site 3D printing techniques. After 200 years, the stick-built home, along with its associated material waste and inefficiencies, may be a thing of the past. I hope these thoughts will stimulate further discussion among the Monogram design community. It’s been an absolute joy to chat with you. Every year, especially in the warmer months, coffee drinkers look towards the colder counterpart of their usual cup of joe: iced coffee. In many cases, iced coffee is just older coffee that is poured over ice. In recent years, a challenger to the cold coffee throne has emerged and its name is “cold brew.” Cold brew has gained popularity exponentially in the last four years, and a simple trend analysis shows that it has no signs of slowing down. So what is cold brew? Cold brew is coffee that is brewed for extended periods of time using room-temperature water. The result is a more balanced, less acidic, and in general, different flavored beverage to both hot coffee and iced coffee. As mentioned, the traditional process is an extended one, often taking 24+ hours to brew a batch of cold brew coffee. This presents a problem for those out there who want their coffee “now” – as we’ve grown accustomed to – as well as for coffee shops who essentially have to estimate the next day’s demand for the cool beverage. Enter FirstBuild and the Prisma Cold Brew Coffee Maker. Prisma makes cold brew coffee in 10 minutes, a drastically shortened timeframe to the more traditional 24 hour brew time. FirstBuild engineers have developed a vacuum pump system inside Prisma’s base that degasifies the water within the brewing chamber and increases the solubility of coffee compounds. To this point, being able to brew a batch of cold brew right when you want it has been impossible. Although Prisma is still a prototype, it does function and produces great-tasting cold brew coffee. In fact, Prisma took home 2nd place in the “Best New Product” category at CoffeeFest, two months ago. Prisma was released via crowdfunding on Indiegogo in August, which allows interested individual to get in early in exchange for a lower price than the eventual $299 retail price. To learn more about Prisma or to sign-up for future updates, visit our website!